Can Jatropha Really Be The Best Solution For Biodiesel? What is the fuss about Jatropha and alternative energy all about? The answer to that question and many more will be presented at JATROPHAWORLD 2008. For those who want to know more about Jatropha, its agriculture, its financing, its processing, its by products and other aspects, then JATROPHAWORLD 2008 is going to bring together the expertise and brightest brains to provide the information required. JATROPHAWORLD 2008 is to be held at the Hotel Mulia Senayan in Jakarta, Indonesia from January 23 - 24, 2008. The conference organizer, Centre for Management Technology (CMT), has brought together the best expertise and brightest brains to discuss and analyze the present and future dynamics of Jatropha. Delegates will be able to increase their knowledge about Jatropha and alternative energy and also network with the most important people from researchers to financiers in the industry. To find out more about JATROPHAWORLD 2008 please visit http://www.futureenergyevents.com/jatropha. Ms Evita H. Legowo, First Secretary of the National Team for Biofuel Development, Indonesia, will start the conference with updates on the latest Jatropha and Biodiesel investments in Indonesia. "Jatropha, today, is a poster child for proponents of renewable energy. It is poised to emerge as a winner for several developing nations and in particular, Indonesia which is emerging as a global hub for Jatropha based biodiesel business with several investors planning to infuse billion dollar investments in the Indonesian biofuel industry," says Dr R.Rajagopal, CCO, KnowGenix, a Mumbai, India based growth strategy firm. Thor Hesselberg, CEO and co-founder of ScanFuel AS, will discuss the cost benefit analysis of a major plantation in West Africa. He will also discuss the pros and cons of a large scale plantation in an Asian, African and South American context. "The promotion of Jatropha Curcas as an alternative source fuel will have a tremendous impact on fighting poverty globally, in addition to giving the world a more carbon friendly alternative to fossil fuel," says Hasselberg. The small scale plantation case will be presented by Mr. Mansor Bin Puteh, Deputy Director, Rice and Industrial Crops Research Centre, Malaysian Agricultural Research and Development Institute, in a paper entitled "Economic and Technical Perspectives as a Smallholder Crop". Four internationally respected laboratories including the Fraunhofer Institute of Molecular Biology and Applied Ecology from Germany and Singapore's Temasek Life Science Laboratory, will discuss the latest findings in the Genomics and Biotechnology of Jatropha. The agriculture of growing the Jatropha plant will be discussed by Dr. Bambang Prastowo, Director, Indonesian Center for Estate Crops Research and Development. Including propagation, Jatropha seed oil yield and intercropping. Mr. P. Krishnamurthy, Asia Pacific Director of KYOTOenergy Pte Ltd, will bring the conference up to date on the Carbon Market outlook and Clean Development Mechanisms and ponder whether it is worth the game. The suitability of Jatropha oil as an alternative energy source or whether the Methyl Ester is preferable will be discussed in three papers to be presented at the conference. Eka Bukit, Director of PT Kreatif Energi Indonesia, will discuss Jatropha refining and press technology and techniques that increase the quality of oil and the speed of extraction. This presentation will be followed by the final open discussion session. 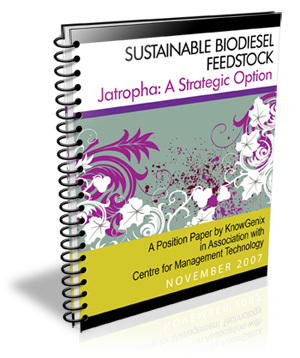 In line with JatrophaWorld 2008, KnowGenix, a Knowledge Partner of CMT since 1996, has released a position paper called 'Sustainable Biodiesel Feedstock. Jatropha: Strategic Option'. The position paper, which is written by Dr. R. Rajagopal of KnowGenix, explains how the biofuel business is a complex web reacting continuously to the traditional oil business as rising oil prices spur demand for biofuels. Complimentary downloadable copies of the position paper are available from http://www.futureenergyevents.com/jatrophapaper/index.html. 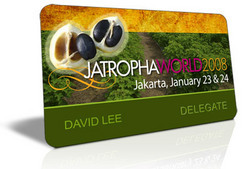 JatrophaWorld 2008 is going to be the most important conference of 2008 for those who want to keep abreast of the latest developments in the agriculture, processing, socio-economics and financing of Jatropha as an alternative energy source. Those wanting more information or who are vitally interested in Jatropha as a feedstock for Biodiesel and alternative energy must visit http://www.futureenergyevents.com/jatropha. While there, they can register for this essential conference. CMT is dedicated to the provision of the latest global technology and business information in the chemical industry through high profile conferences focusing on renewable, liquid energy sources. CMT has organized industry specific conferences on Liquid Natural Gas, and LPG, ground breaking summit on technologies like Coal to Liquids, Gas to Liquids, and Bio-mass to Liquid, and alternative energy or future fuels forums like Biodiesel, Biofuels and Ethanol. This has established CMT as the market leader in promoting this nascent industry as an alternative global powerhouse. CMT LogoCMT is dedicated to the provision of the latest global technology and business information in the chemical industry through high profile conferences focusing on renewable, liquid energy sources. Jatropha Position PaperThe Position Paper 'Sustainable Biodiesel Feedstock. Jatropha: A Strategic Option' aims to provide you with an overview of the latest trends and shifts occuring in the Jatropha value chain.